“Founded on May 15, 1851, Alpha Delta Pi is the oldest secret society for college women in the world. 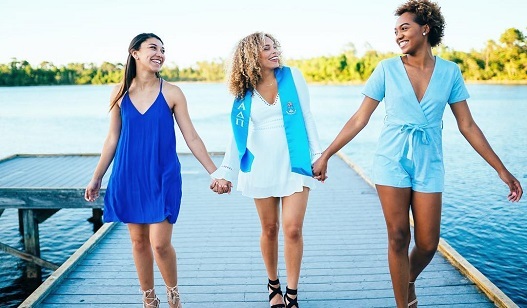 Established at Wesleyan College in Macon, Georgia, the first college chartered to grant degrees to women in the world, the story of Alpha Delta Pi is a remarkable one and it all began with a young girl’s dream. When Eugenia Tucker decided to form a society, her dearest and most admired friends were asked to join her. She listed them in her journal as: Ella Pierce, daughter of a bishop; Octavia Andrew, daughter of a bishop; Bettie Williams of South Carolina; Sophronia Woodruff; and Mary A. Evans, daughter of a useful and beloved pastor of Macon Mulberry Street Methodist Church for several years. Ella’s interest in education was inherited from her family. Her father, Dr. George Foster Pierce, served as the first president of Wesleyan Female College and later served as president of Emory University. Ella was described as a “most charming young lady with seriousness of purpose and great determination.” Ella had twelve children and her legacy lives on today with the many family branches that have ties to Alpha Delta Pi. Only 13 years old when she made the journey to Wesleyan, Octavia was the daughter of Bishop James Andrew who was the ranking member on the original Board of Trustees that started Wesleyan. After graduating, Octavia married John Wesley Rush, an Emory law student. They had ten children and John abandoned his law studies to become a Methodist preacher. During the Civil War, Reverend Rush went to defend the South and was captured in battle. Octavia remained a scholar and continued her involvement with Alpha Delta Pi until her death in 1917. Like Ella, many of Octavia’s descendants are Alpha Delta Pi sisters. Elizabeth was born in Marion County, South Carolina, and is the only Founder who was not a Georgia native. Her father was a doctor and trustee at the Georgetown Methodist Church. Undoubtedly, this association with the church influenced Elizabeth’s decision to attend Wesleyan, more than 450 miles from her home. She married Thomas Mitchell, a Methodist minister, and they had five children. “Bettie” as she was known at Wesleyan, died in 1884, just 13 days after the death of her eldest son. Elizabeth’s great-great-granddaughter was initiated as an Alpha Delta Pi at the sorority’s 2011 Grand Convention. Sophronia was born in 1835 in Augusta, Georgia and her family moved to Columbus, Georgia before Sophronia turned five. Her father, Dr. Michael Woodruff, was a prominent physician in Columbus, in addition to serving as a city alderman and president of the Muscogee Bible Society. Sophronia received her A.B. degree from Wesleyan in 1852. The subject of her commencement composition was “Selfishness – the Axis on Which the World Turns.” Sophronia died in 1913 at the age of seventy-eight. Mary was born in Forsyth, Georgia in 1833. Like many of her Adelphean sisters, her father was a Methodist minister. He also served on the Wesleyan Female College Board of Trustees for forty years. Mary received both a literary and a musical education, graduating from Wesleyan with distinction. She married Sanford Glass, a lawyer, and they had one child before Mary’s husband died in the Civil War. She went on to teach at a private school and until her death in 1914, remained very active with Alpha chapter in Macon. Click here to download high resolution Founders Photos suitable for framing.